There are over 500 million domestic cats and 33 different breeds. More then 35,000 kittens are born in the US each year. Cats can see up to 120 feet away. The average cost to care for a cat for its life is $7000.00. I think that mine is going over the 7000 mark because I spoil him. 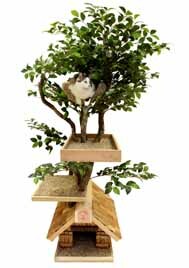 The picture is the latest designer cat tree that I have bought for him. He now takes one whole bedroom.